The cuckoo clock is the epitome of the Black Forest clock. As already mentioned, the exact start of clock production in the Black Forest cannot be traced back 100%. There is also disagreement about when and where the first clock was built with the cuckoo mechanism. It can be presumed that a mechanism by means of which a cuckoo figurine produced its unmistakable sound via a small organ pipe and bellows was first developed parallel in other units with figurines. It is certain that already in 1619 a clock with a cuckoo sound could be found in the collection of Elector August of Sachsen. Sources also convince us that starting in 1669 at the latest the mechanism had become generally known, and the idea of using the cuckoo's sound as the acoustic signal in wall clocks quickly enjoyed growing popularity. Whether it was Franz Anton Ketterer in 1730, or Michael Dilger and Matthäus Hummel in 1742 who started to build the first Black Forest cuckoo clocks, or whether the start thereof dates back even earlier remains to be determined. It is certain that the Black Forest cuckoo clock pioneers helped this form of clock achieve its ultimate breakthrough and international fame today. However, the early cuckoo clocks differed extensively from those of the present. The striking mechanism with the cuckoo sound was installed in diverse forms of clocks, in framed or shield clocks. The first cuckoo clock that comes close to the models of today was the Bahnhäusle clock, developed in 1850, the design of which imitates a railway signalman's house. It resulted from a design competition of the Baden School of Clock-making in Furtwangen. After a short time already, the cuckoo had so to speak “conquered” this form of clock case for itself, and the ultimate triumph of the cuckoo clock as we know it had begun. The original form of today's cuckoo clock was consistently further developed starting in 1860; it was furnished with elaborate carvings and pine cone weights, and developed bit by bit into a symbol of the Black Forest. A cuckoo clock is typically comprised of a pendulum movement to show the time, and a striking mechanism for the cuckoo's sound, both of which are moved by means of a chain hoist. 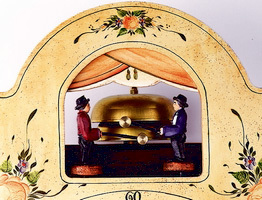 Sophisticated machinery moves the hands and also regularly on the hour causes the bellows fill two small organ pipes located in the clock's interior with air, and then collapse, one right after another. A high and a low tone follow one another, and the cuckoo sound generated by this indicates exactly how many hours have been struck. Nothing has changed about this mechanism today. To perfect the illusion, at the same time a door in the ridge of the clock's roof opens, and a carved cuckoo bird slides out and moves to the tact of the calls. Most similar to the rather geometrically designed original shape are the models available under the collective term of “Traditional carved clocks”. The little house is almost always entwined by a vine tendril with several leaves here. Birds or hunting motifs complete the decoration. The cuckoo clocks known as chalet clocks naturally also have a little house as well, but it is usually designed as a traditional Black Forest house or manor, with windows, roof shingles that are often carved by hand, flower boxes and other decorative accessories. In addition, it stands on a sometimes rustically, sometimes lavishly decorated platform with scenes from nature or other motifs. There are cuckoo clocks with a 1-day power reserve, or larger clocks with an 8-day power reserve. Many of the larger clocks are additionally furnished with high-quality mechanical musical drums. These clocks possess a third chain hoist mechanism, and thus also a third weight which drives the musical drum. In addition to the music, dancers move about on a rotating disc underneath the cuckoo's door. Such elaborately designed masterpieces of artisanal clock-making often have additional movable elements. Traditional motifs such as mill wheels, movable sawmills and beer garden scenarios are especially popular. On the hour, miniature worlds come to life on the clock platform. And of course in addition to the mechanical clocks, cuckoo clocks with quartz mechanisms and digitally generated cuckoo sounds/music are available in all sizes and versions. Weights and pendulums are just for show here, but the design of the case and the decorative elements are also solely done by hand on these clocks as well. Modern touches have also found their way in. In recent years there was a small boom of cuckoo clock models that generally continue to include a little house and a cuckoo, as well as the tried-and-tested mechanisms, but are presented in a modern design. Flashy colors or austere geometry and the usage of typical traditional decorative elements in a new design creatively challenge and reinterpret the term “cuckoo clock”. Since Black Forest cuckoo clocks are such a popular gift to bring along, for smaller budgets there are also diverse clocks called souvenir clocks. They are generally quartz clocks, but this segment also includes clocks with spring mechanism. Here you can find little clocks that have no cuckoo, but a cuckoo sound, somewhat larger ones with birds, and clocks with a quarter-hour call, in which the cuckoo calls out once every 15 minutes. 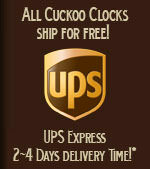 The production of cuckoo clocks demands a great deal of experience and manual dexterity. The extensive work by hand does not make a cuckoo clock unique, but it is far from being a mass-produced product. 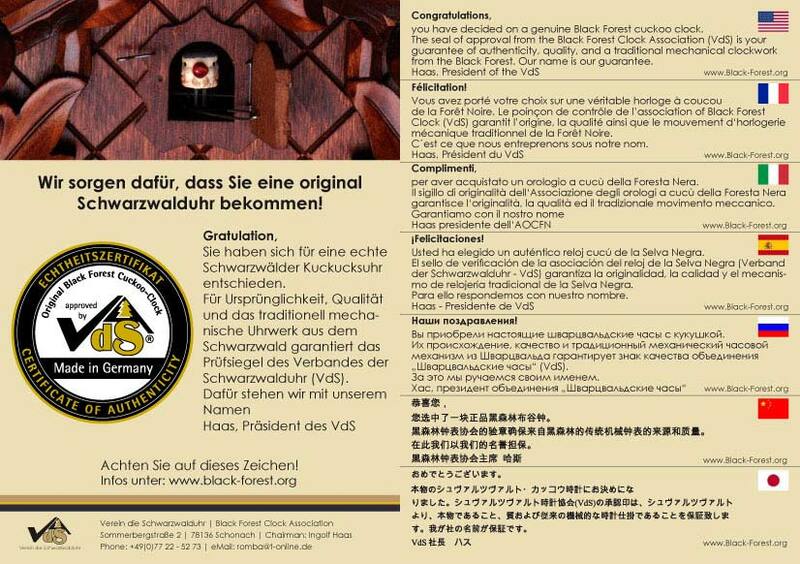 The manufacturers are not fixated on producing cuckoo clocks at a price that is a cheap as possible; instead they are obligated by tradition to apply high quality standards. 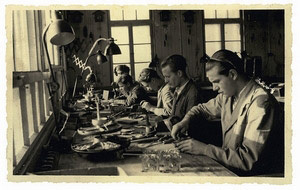 The production methods include in part centuries of tradition, and have been passed on from generation to generation by the employees of the Black Forest clock producers. A multitude of steps is necessary for a cuckoo clock to arrive at the customer's home in the quality accustomed to. Specialists in different skilled crafts professions are entrusted with the individual work steps, so that these quality demands can be met. 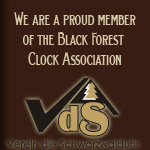 Most producers of Black Forest clocks have their own in-house carpentry and carving shops, and consistently put their faith in their own staff. First the right wood must be chosen, which is generally local linden wood. The cuckoo clock wood is roughly cut to proportion and dried for several years. Only well-dried wood ensures that the wood will not warp after production. Further, the carver has a better job of it with dried wood. The well-dried wood is cut into pieces corresponding to the size of the respective Black Forest clock. Extensive quality controls of the wood already take place at this stage. Pieces of wood with coarse unevenness and irregularities are rejected, so that no cracks occur at a later point. One of the most important parts of the cuckoo clock is the front side. It is the calling card of every clock and requires a large amount of the time spent working on a clock. Experienced carvers skillfully implement the respective motif. When you look at the clocks up close, you can recognize the typical marks of the knife, as only hand-carving can produce. The roofs are often covered in hand-carved shingles. To do so, every single shingle of the cuckoo clock is individually laid. The figurines are also carved by hand, and, depending on the style of the respective workshop, produced in a rustic or a filigree method, ensuring that a suitable clock can be always found for everyone's taste. An additional important part of every cuckoo clock is the mechanical movement. This too is produced in the Black Forest and is precise and long-lasting. The movement is the heart of a cuckoo clock's interior and is built into the case along with the other mechanical parts. A clockmaker creates the connection between the movement and the movable parts (such as the hands, cuckoo, dancing couples or figurines). Each of the mechanical cuckoo clocks is of course subjected to extensive inspection, and tested for at least 24 hours in terms of its functional precision before it is sent off for delivery. We hope you enjoy perusing the diverse world of our cuckoo clocks!